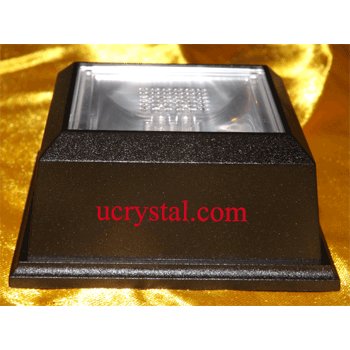 We carry premier quality LED light base for crystal. 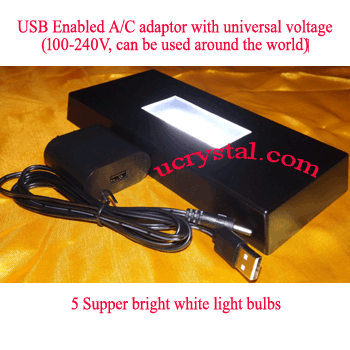 The electrical adaptor, with universal voltage (100-240V), can be used around the world. 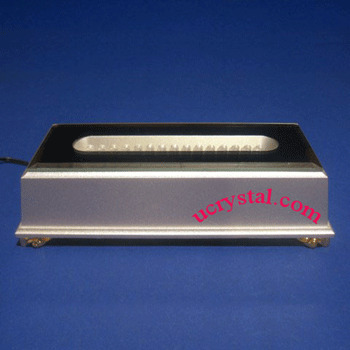 We have light emitting diode (LED) light bases and crystal rotary light bases to help you display and enhance your 2D or 3D laser engraved photo crystals, glass sculptures, glass art or Swarovski figurines. These light display stands (also called rotary light base, crystal light stands, or lighted bases) make the laser etched crystals more eye-catching and elegant. 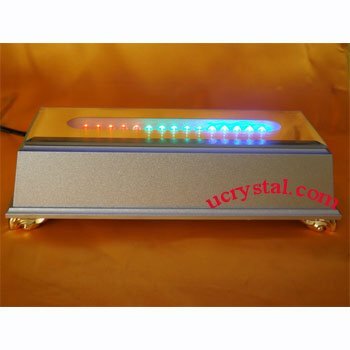 Most of these light bases for crystals have mirror top surface, and the LED light display stands come in either white color or multi-color. 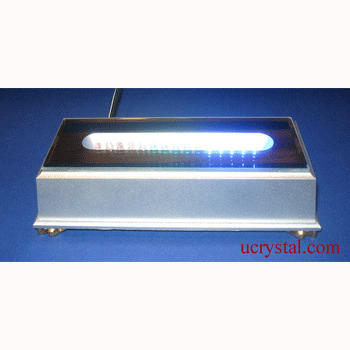 The white color crystal light bases deliver constant light intensity while the multi-colored crystal light bases show rotating color with changing intensity. The light bases for crystals are suitable for both home uses and public display. 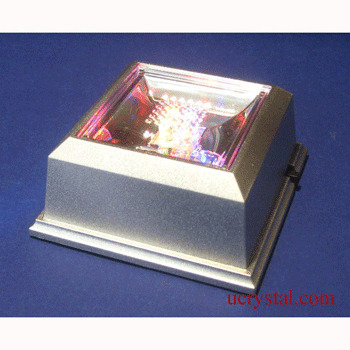 These crystal light bases can be either operated with a wall adaptor, batteries, or both. Please click individual crystal light bases for details. 7-3/8" x 3-3/8" x 1"
Add this beautiful rectangular light stand will make your personalized photo crystal wedding centerpiece, crystal glass art and glass sculpture shine. 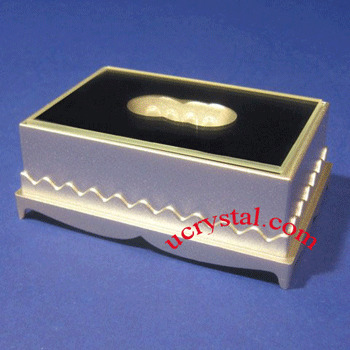 Add this elegant rectangular light stand will help you display and enhance your 2D or 3D laser engraved photo crystals, glass art figurines. Alternating in red-blue-green LED light bulbs. 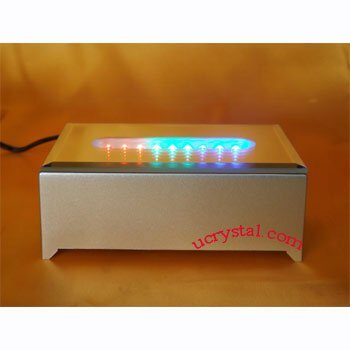 This lighted display stand will enhance the look of your 3D photo crystals or glass art, through which image contrast enhancement can be achieved. This led light stand offers a stylish, spectacular look through alternating in red-blue-green LED light bulbs for your 3d laser photo crystal, sculptures and crystal art pieces. Rectangular, red, grean, blue changes alternatively. 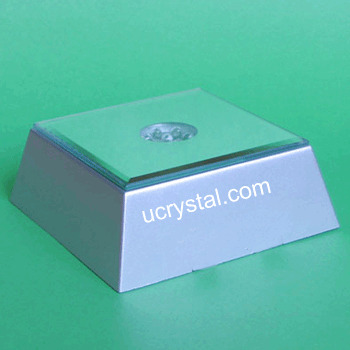 Add on this light base to beautifully display your 3D laser photo crystals. 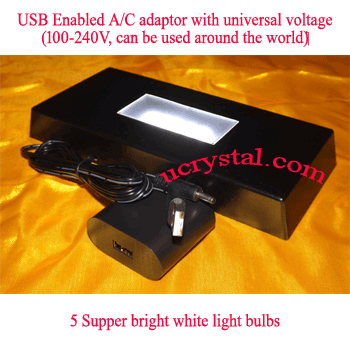 Brilliant LED lights shine through the display base giving your 3D laser crystals image contrast enhancement. This multi-color LED lights light stand offers a stylish, spectacular look and provide bright LED lighting for your personalized 2D 3D photo crystals, glass art pieces or showpiece! 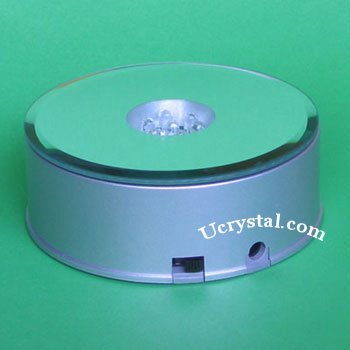 This unique rotating crystal display can enhance your 3D laser crystals image contrast effect and beautifully display your favorite crystal glass figurine. 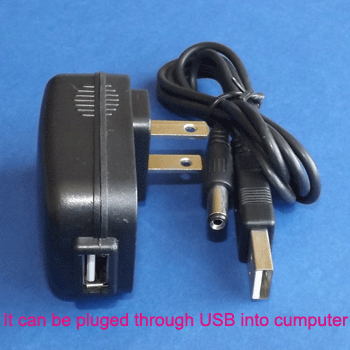 3.5’ cord, the unit can also be operated with 3AA batteries (not included). 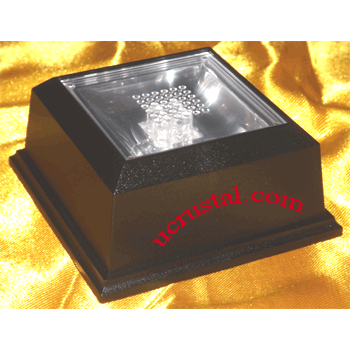 Add this rotary light base to beautifully display your favorite glass sculptures, glass art or Swarovski figurines. 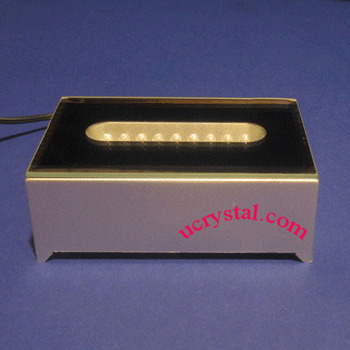 The visual effects of the laser engraved photo crystals can be improved by using 7 LED light bases. 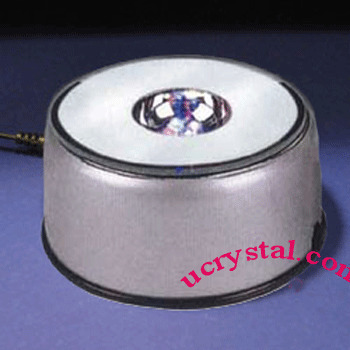 Light stands for crystals -7 LED, white-color, square. mirror top 3-3/8" x 3-3/8", bottom 4” x 4”, height 1-1/2"
A/C adaptor is NOT included. 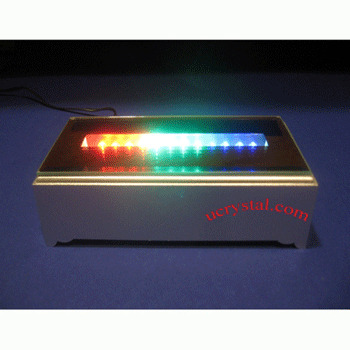 The visual effects of the laser photo crystals can be improved by using this brilliant multi-color lights light base. 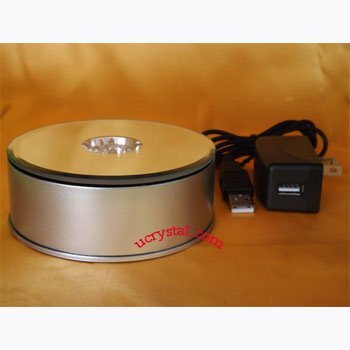 Through this light base’s bright LED lights, your personalized photo laser crystal image contrast can be enhanced. Square, silver color, 2-1/2" x 2-1/2". 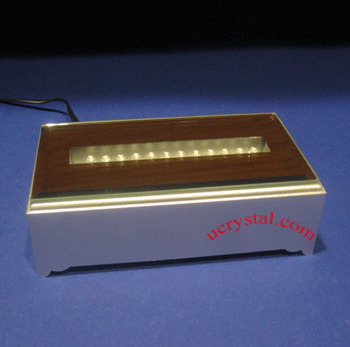 Add this beautiful rectangular light stand will make your 3D photo crystal, custom engraved crystal award, crystal glass art and glass sculpture shine. 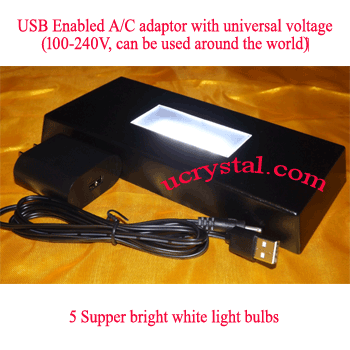 Rectangular, black color, Top surface 7-3/8" length x 3-3/8" width, bottom 8" x 3-1/2" and 1" height. Top light aperture opening: 3" x 1-3/8".